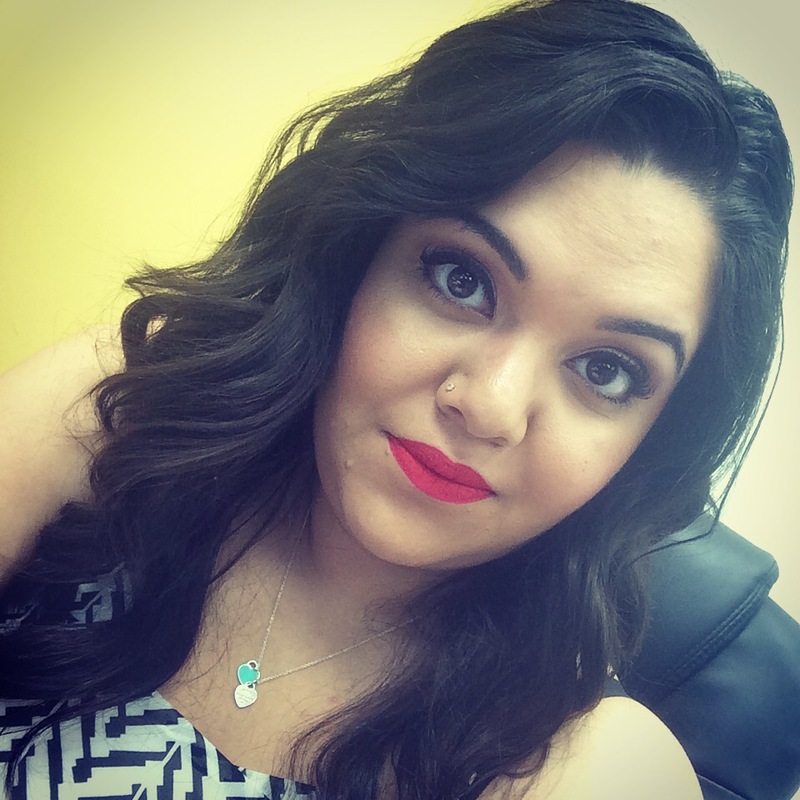 Beauty By NZ | Follow @natasha_zamir [instagram] – All you need to know about the latest beauty products! 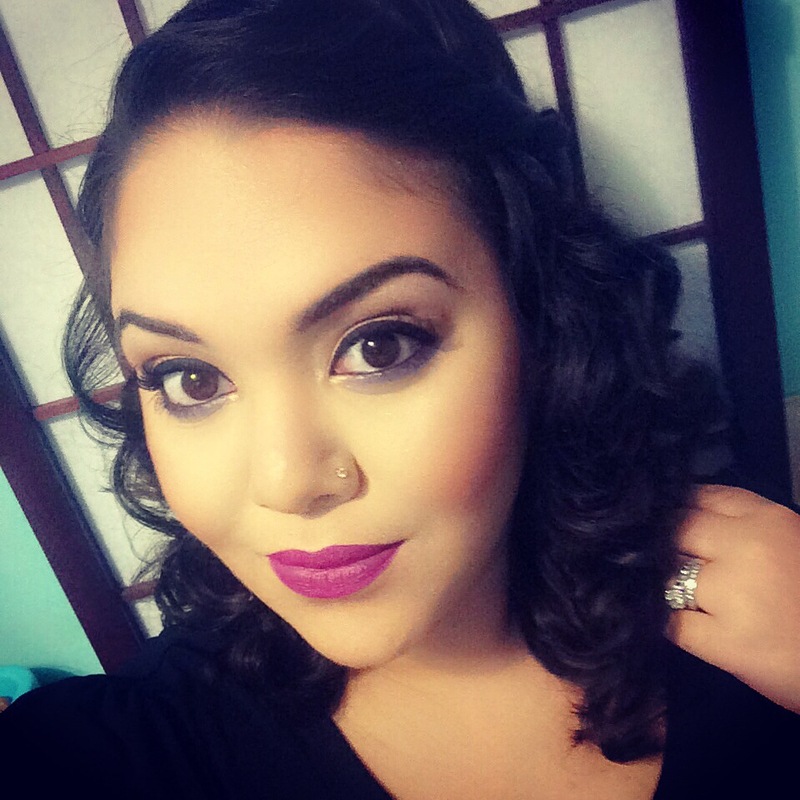 Follow @natasha_zamir [instagram] – All you need to know about the latest beauty products! Hi guys and gals! I know it has been a while since i posted anything on my blog. I have been a little sick and just busy with other things! SO SO SORRY! BUT please in the comments below, email, or even instagram me your requests of what you would like to see next as my blog post! If there is a specific look or would like for me to review anything please feel free to leave it in the comments! I will try to get to it as soon as i can! I hope you guys have a wonderful weekend!!!!! P.S. Thank you for all your patience and support! 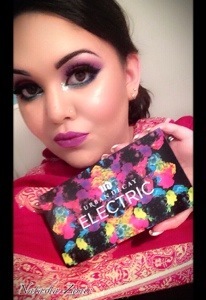 Purple Lovin’ FT. Urban Decay & Illamasqua! Hello loves! I know it has been a while since I posted anything on my blog. I have been away for a while, but now I’m back. 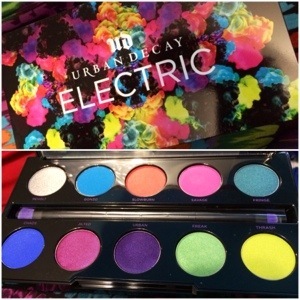 So as most of you know, I purchased the Urban Decay Electric Palette about a month and a half ago & i LOVE IT! Last night, I thought I’d play with it a little more and wanted to create a look I can pair with a new lipstick that I got. 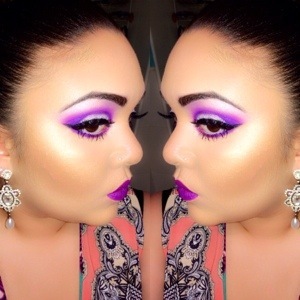 Let me stop rambling & let you guys know how I achieved this look! Filled in my eyebrows with ABH dipbrow pomade in EBONY. I primed my lids with MAC Soft Ochre paint pot. In the crease I used a little bit of SAVAGE and blended it out until it gave me the “softness” I was looking for. In the socket I used URBAN with a dense shader brush. This will deposit more color and make it look more defined. Using a blending brush, I blend between the two colors to give a gradient affect. You don’t want it to look harsh. On the lid, I applied a silver cream shadow, and added REVOLT on top. For my eyeliner, I used NYC Liquid Liner. I Love this eyeliner because it has a very thin brush and it is very easy to control. For lashes, I used Red Cherry Lashes #48. I moisturized my face with Olay Face Moisturizer. I primed with Benefit Porefessional. For foundation I used Make Up Forever #140. Under my eyes to Highlight I used Nyx Concealer in LIGHT and for contouring I used a darker foundation. To set my foundation I used Hello Flawless powder from Benefit, to set my highlight I used Emphasize from MAC, and for setting my contour I used Too faced Chocolate Soleil Bronzer. For my cheekbone highlight, I used Mac Mineralize SkinFinish in GLOBAL GLOW and for blush I used NARS LUSTER. 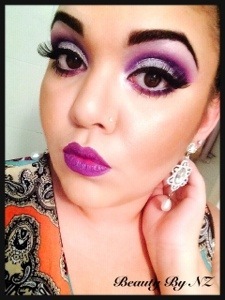 For Lipstick I used, ILLAMASQUA ESP! If you have any questions, Please leave your comments below or feel free to comment on my Instagram page (natasha_zamir). I will do the best that I can to answer any of your questions! Also, if you have any requests or would like to see something in specific, please let me know! So let’s talk a little about skincare. I know make up is amazing and it covers one’s imperfections like redness, blemishes, uneven pigmentation, pores and so on.. BUT taking care of your skin is very important. You want to cleanse, moisturize, & even start using anti aging products. It’s never TOO EARLY to start using these type of skincare methods. Your skin needs the proper TLC and it’s nice to pamper it once in a while. Enough of my rambling, let’s get down to the point. When I was working at Sephora, we were given these little sample size things of this mask. To be honest with you, I never really cared for facial masks. I only washed my face with cleanser and applied moisturizer and that was it… I never exfoliated, until i got the Clarisonic, but that’s a whole different topic lol. So i thought I’d give this a try. Let me tell you, this stuff is AMAZEBALLS. I did this mask before my nightly bath. I took off all my makeup, I washed my face gently to remove excess residue from makeup and makeup wipe, and then I applied this mask with clean fingers!!! MAKE SURE TO WASH YOUR HANDS BEFORE. You don’t want to add dirt and bacteria to your face. I left the mask on until it dried. It says to leave it on for 10 minutes, but I’m a rebel and left it on longer LOL. It feels cold and tingly when applied. I removed the mask in the shower with warm water, moving my fingers in circular motion. This will help exfoliate a little more. My face felt amazing after. It was smooth, it felt fresh, and definitely looked brighter. 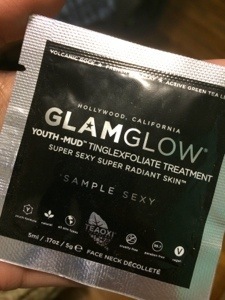 So this mud mask is supposed to leave skin noticeably radiant and glowing. It works with the body’s natural moisturizing collagen to provide gentle resurfacing exfoliation and helps to leave skin smoother, brighter, and softer. 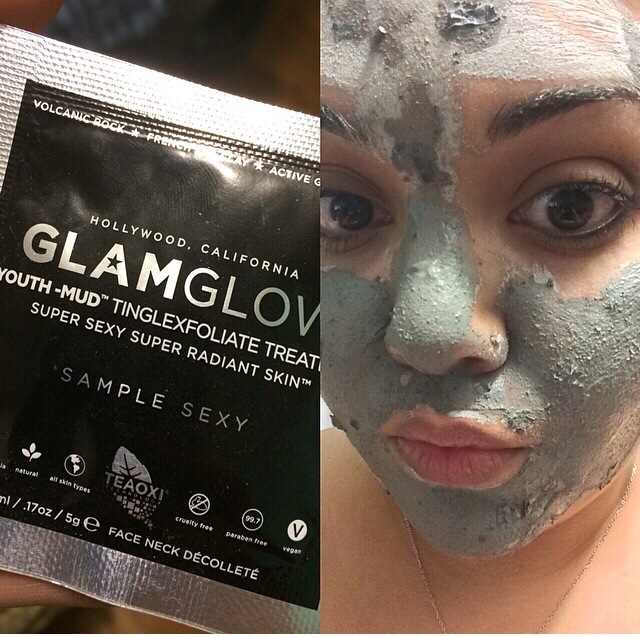 This mask also makes the texture of your skin tighter and helps tighten up the pores. It gives a more youthful appearance and absorbs impurities without removing natural oils. You should also know that this mask is also formulated WITHOUT the following ingredients: Parabens, Sulfates and Phthalates. NOW – the one thing that I DON’T like is the price .. For 0.5 oz, it is $19.00 & for 1.7 oz it is $69.00. But, if it something that works for you and is benefiting your skin, it’s worth it. REMEMBER – this is something that can NOT be done everyday. Depending on your skin type and sensitivity, you may want to do this 1-3 times in a 7 day period. I filled in my eye brows with Anastasia Beverly Hills Dipbrow Pomade in “Ebony” – with concealer, I cleaned out the edges. I applied Urban Decay Primer Potion in “original” – this will keep your eyeshadow from creasing – then as a base I applied NYX Jumbo pencil in “Milk”. In the inner third of my eye, I applied “Thrash” and “Revolt”. I then used “Savage” and “Slowburn” on the rest of my lid. Make sure to blend in between so the colors blend into each other. You don’t want to see any harsh lines. In the crease I applied “Urban” to give it a smokey effect. To blend that color I used “Jilted”. This gives it a nice gradient effect. From a dark purple to a light purple. On my bottom lashline I applied “Chaos”, “Gonzo”, & “Fringe” & in the inner corner I applied a little bit of “Freak”. I applied my Sephora Liquid eyeliner and added Urban Decay Glitter liner to the inner corners to add a little sparkle. 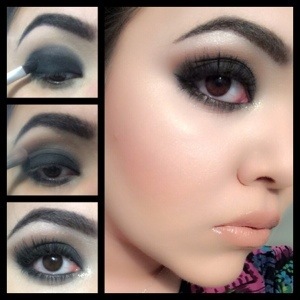 For mascara I used Giorgio Armani Eyes to Kill & used Eylure Eyelashes #205. I moisturized my face & applied my Primer from Benefit. For foundation I used – Make Up For Ever #140. I did some serious highlight & contouring for this look – for highlight I used Kat Von D concealer on light & for Contour i used a dark foundation stick by Maybelline. To set my foundation I used any pressed powder. To set my contour color I used Smashbox Halo Bronzer. For Blush I used MAC Cosmetics Blush in “Dame” and for highlight on my cheekbones, bridge of my nose, & cupids bow, I used Becca Shimmering skin perfecter in “Opal”. 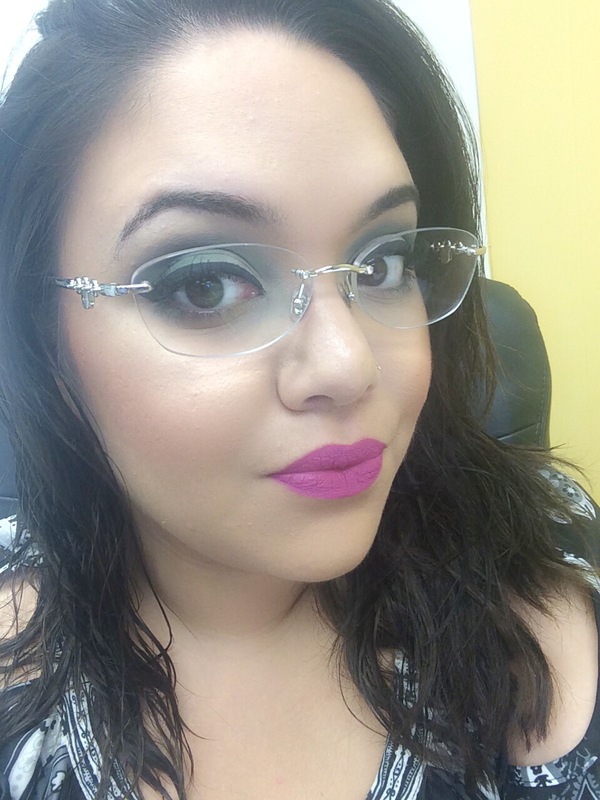 Urban Decay did it again!!!!! on March 18, 2014, this BEAUTIFUL palette was released! If you love make up & have an open mind to color, you will LOVE this palette. Let’s talk about packaging – it’s sturdy. It has a magnetic closure, which keeps the palette nice and shut. It comes with a double ended brush & a little sampler of their 4 eyeshadow primers. There are 10 colors in this palette. Each of them are highly pigmented. 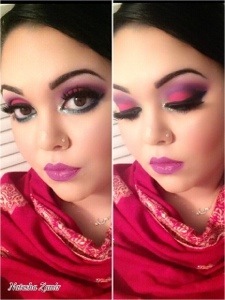 The colors are so bright and you can create many different looks with this palette. I just wish they would have put in a different color instead of the silver. A yellow would be nice or even a neon orange, but something that was BRIGHT and not blehh. Now, there is something I NEED to put out there. 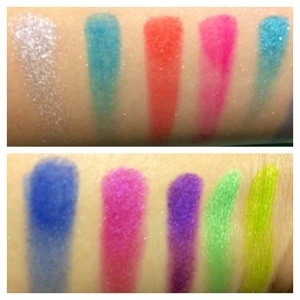 Urban Decay makes sure to tell you that FOUR of these colors are NOT safe for the eyes. The colors are Slowburn, Savage, Jilted, & Urban. Not sure why, but I believe it’s because they were not FDA approved yet, BUT that didn’t stop me LOL. For people out there that want to try out this palette, use it at your own discretion. I personally did not have any issues with those colors in specific, BUT I did find that they stained the eyes when removing makeup. OVERALL, I love this palette, fall out was not bad, and color pay off is amazing! Let me just say AMAZE BALLS! Recently, i was on YouTube, & came across a review of these bad boys! 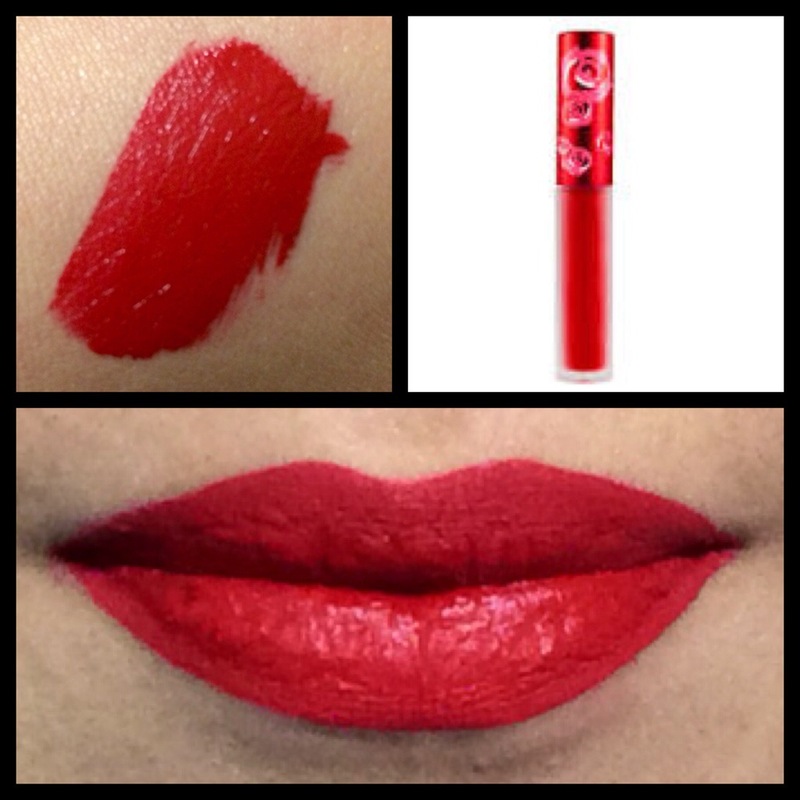 I love lipstick because it is long wearing, and mostly pigmented. I never really liked gloss because some are sticky and some are just .. ehhh .. not colorful. I stopped by my favorite Sephora & picked up two colors. They have a few nice colors, but being that they are $24 a piece – i’ll just hold off on the other colors LOL. 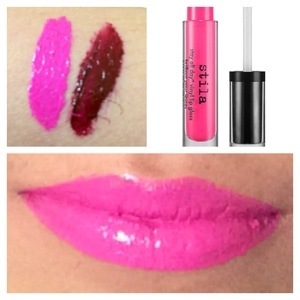 These “glosses” are not sticky, they are SUPER OPAQUE & very VERY long wearing. Gloss won’t dry out lips thanks to the infusion of nourishing and moisturizing ingredients such as seaweed extract and green coffee oil. 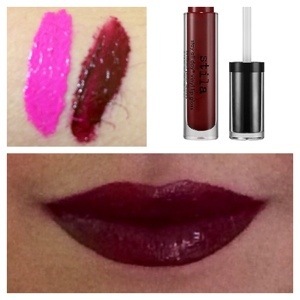 Simply apply onto lips for color and shine that stays in place throughout the day. The swatches above are JUST ONE APPLICATION!!! I can eat, drink, sleep, do whatever & it’ll stain my lips. Would I recommend these to anyone?! YES! it doesn’t smell (some glosses smell yucky and i can’t stand it!) & taste like berries? LOL – GO GET YOURS NOW! Spring & Summer are coming up, you NEED bold colors & can NOT go wrong with these 😀 These would go perfect with a very simple eye look for example -winged eyeliner and neutral eyeshadow. What can i say about this beauty?! I LOVE it! It is the perfect red. It is cool toned which gives that blue tint to it. The formulation is exactly the same as the suedeberry color i reviewed in a few previous posts! If you are looking for a red stain, this is it! I wanted to take the chance and talk about my favorite cleansing tool ever!! 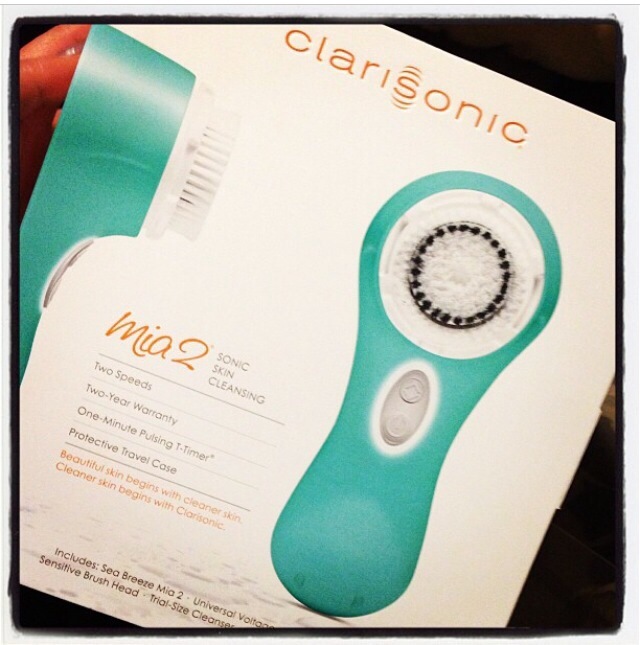 It is the Clarisonic Mia 2! Probably the best investment I’ve ever made. Although, it was around $200 or maybe more (don’t remember exactly!) I don’t regret buying this. I once had severe acne. I’ve tried many products like proactive, clean & clear etc. but nothing really worked and made my skin worse. I even tried certain home remedies – but no luck. When I started working at sephora, we were having a clarisonic event, I had to demo and try to sell as many as I could. By the end of the day, I was sold myself. I splurged and I bought it. Now remember, this is a form of exfoliation so you DON’T want to do this everyday. It can be very harsh on the skin. I use the clarisonic in conjunction with my favorite cleanser. After a few weeks of using it I saw a difference in my skin. It was brighter, it got every inch of dirt and makeup off and my acne started to clear up. I swear by this and recommend it to everyone! Get yours at your local sephora or Macy’s!